I’ve written about how you can find poorly listed eBay auctions with typos, buy cheap then resell at a higher price, again on eBay. Today we’ll look at the more traditional method of buying in the real world, then listing the item for sale online. Priced low enough, buying what you don’t want or need on Kijiji, Craigslist, at a flea market, or even garage sale may be the best purchase you can make! It will be that much easier to promptly list it on eBay and make a tidy profit for your trouble. The trick here is the item must have enough potential for profit when you factor in your own time. You can estimate what the selling price will be with some quick research on eBay, which I will describe in further detail later. The bidding system on eBay is an economic marvel, as people will pay what an item is worth to them, and sometimes it’s vastly different than you’d expect. This is when the worlds of “real” versus perceived value collide. If a product is rare or sold out everywhere, even the manufacturers are surprised and often disapproving of the sky-high prices their products sold for via auction. Perhaps they’re wishing they sold it on eBay themselves? 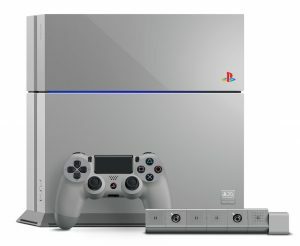 “That’s not what we want to see happen,” said a Sony exec when their limited edition 20th Anniversary PlayStation 4, styled after the original PS1, sold for thousands on eBay. One went for $20,100, while another had a final bid of $15,100. 12,300 individually numbered units were made. It originally retailed for $500. An important and too often overlooked step is research. Listening to your gut can bring you entirely off base, as your perception of an item’s value may fall outside the average. What you need is objective data to make an informed decision. Every marketplace gets different results, so as you plan to sell on eBay you’ll need to know real world prices auctions have sold for in the past. 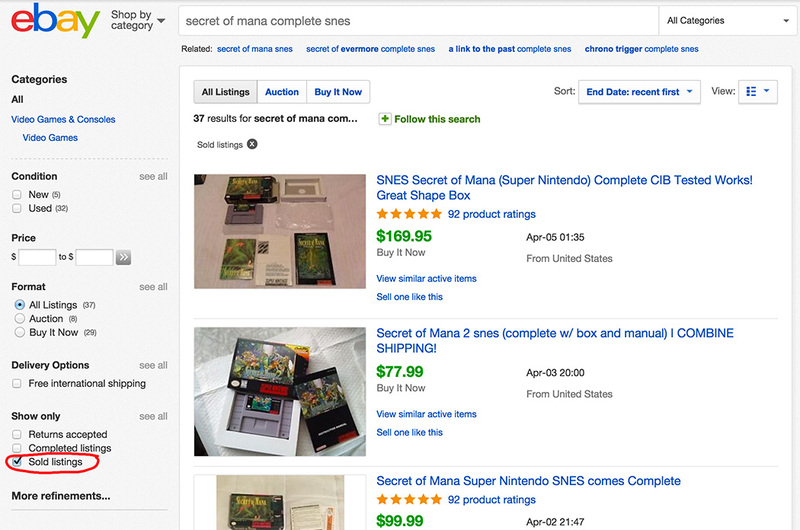 Let’s say you come across a stack of retro game cartridges at a garage sale and you spot The Secret of Mana, one of the most collectable SNES games. To check the price it’s sold for in the past, visit eBay, type in the name of the item, then check “Sold listings” under “Show only” in the sidebar. You’re only interested in what an item actually sold for because there are too many folks trying to sell items for more than it’s worth and you can’t let this cloud your judgment. Prices may vary greatly depending on sheer timing, location of the item, and the quality of the listing. It never hurts to err on the side of pessimism so you’ll only take risks truly worth taking. Some people are in a tough spot and need their items sold quickly or simply lack the patience or knowledge to sell items for the highest price possible. In many cases you can offer Kijiji or Craigslist sellers a fair price and still make cash on the resale of an item, so if possible try to make every deal win-win for everyone involved for extra karma points. Posted in eBay and tagged PlayStation 4, Super Nintendo on April 7, 2017 by admin.